Our upscale Sicily group tours are simply one of the most rewarding historical and architectural tours we offer. Join us in our Sicily tours and enjoyable the luxury of small group tours. Sicily isn’t one of Italy’s top tourist destinations, but we think it should be. We’ll explore diverse cultures and landscapes, and indulge our senses with visits to top restaurants, wineries and even a chocolate factory. Our route will follow the Romans, Greeks, and Arab-Normans, all of whom inhabited the area; we will witness the amazing architecture, and incredibly rich history they left behind. 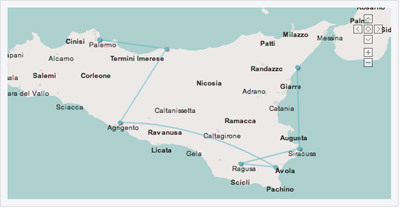 Join one of our upscale Italy small group tours to Sicily. Enjoy upscale travel and tour in a relaxed pace. We’ll use comfortable vehicles, provide you with a mix of fabulous accommodations and the fantastic food and wine Sicily is known for. Note: Activities or order of activities are subject to change due to unforeseen closures, etc. We will meet you at the airport in Palermo and our private transfer will take you to our hotel, a 19th century grand hotel in the historic district of Palermo. This morning, we’ll drive east of Palermo along the coast towards Cefalu, a lovely fishing village built on a rock that juts out into the sea. Its 12th-century Romanesque cathedral is considered one of the finest Norman cathedrals in Sicily. After the tour, enjoy the sites and do some shopping, or simply walk its medieval streets and promenade along the water. Later this afternoon, our local Sicily tour guide will show us the highlights of historical Palermo, capital of ancient Sicily. Colonized by the Phoenicians, Sicily boasts a rich 3,000 years of history, particularly flourishing under the Arab and Norman rule. The many great empires that once ruled Sicily’s capital left behind wonderfully diverse architecture, from Roman to Byzantine to Arab-Norman, which we will view in the city’s palaces, churches and crypts. We’ll sample a unique flavor of Italy, one with a touch of Africa, as we experience Palermo’s street life and its ancient market, perhaps the Mercato della Vucciria. We will also visit the city’s eclectic cathedral — originally Norman, then Catalan Gothic, and in the 18th-century, transformed by baroque and neoclassical styles. Today, our Sicily tour will take us to the historic town of Erice, which sits on top of Mt. Erice, overlooking the city of Trapani. The city’s ancient remains are layered with history, from the Elymian and Phoenician walls dating from the 5th century to its twin castles — Pepoli castle from the Saracen times and Venus castle, from the Norman period, built on top of an ancient temple of Venus. Erice’s sights also include an interesting museum and a 14th century church. 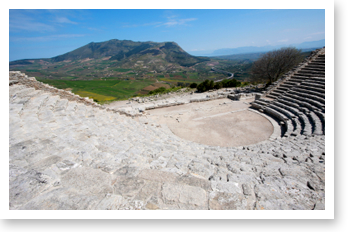 Our group will also also tour Segesta, one of the major cities of the Elymian people, one of the indigenous peoples of Sicily. Ancient settlements high on top of Monte Barbaro have vanished but a magnificent Doric temple remains. 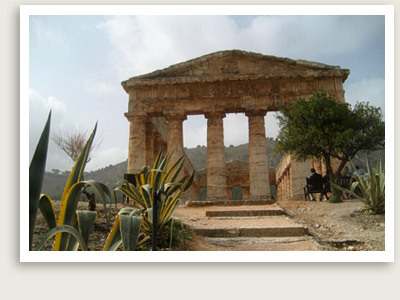 This morning, you will have a guided tour of the Valley of The Temples in Agrigento, famous for its five Doric temples. Not even in Athens will you see Greek temples this finely preserved. Our guided tour will take us through the spectacular ruins of the archaeological park, where numerous temples, burial places, homes, and other artifacts give us clues to how the ancients lived. Sleep in and enjoy our beautiful and comfortable hotel overlooking the sea. Founded in 734 BC by the Greeks, Siracusa was one of the great ancient capitals of Western civilization. This city quickly grew to rival and even surpass Athens in splendor and power. Siracusa still has some of the finest examples of Baroque art and architecture, along with fantastic Greek and Roman ruins. Siracusa is definitely one of the most beautiful places to see in this trip to Sicily. A local guide will take us on a guided tour of this city and its archeological sites, including a Roman amphitheater, beautiful Greek temple, a famous grotto called the Ear of Dionysus, and the most complete Greek theater surviving from antiquity. lThis morning, we will make our way to Taormina. On the way, we will take you to Piazza Armerina, home to an important third-century Roman villa and imperial hunting lodge. Visiting Villa Romana del Casale, you will be able to see some of the best mosaics of the Roman world. Enjoy a guided tour of the villages that thrive on the slopes of Mt. Etna, while sampling Sicilian products along the way. You will travel to different local villages of the Alcantara Valley, visit the Alcantara Gorges and a wonderful waterfall created from an old Etna lava flow 40 miles long. Today, our small group tour of Sicily will take you to Savoca, selected by director Francis Ford Coppola as one of the settings for “The Godfather II.” You may recognize the stunning seaside views from the piazza and terraced bar here as part of the set used for the wedding reception in the movie. We will then head to Castelmola, a medieval hill town above Taormina with breathtaking views of the sea and Mt. Etna. Our next stop is the village of Forza d’Agro, another charming medieval hilltop village with a fantastic view of the coast and Mt. Etna. We will visit its unique Norman castle with three castle-walls and a wonderful coastline view towards the straits of Messina. Some scenes from “The Godfather III” were shot in this enchanting place. We will then stop in less touristy and charming Castelmola, a medieval hill town above Taormina for its amazing views and medieval streets. We’ll return to Taormina where you can have lunch on your own.